SEA GIRT, NJ USA -- PAYMENT/DELIVERY SYSTEM REFORM UPDATE NEWS SERVICE -- OCTOBER 17, 2017: Concerned about escalating hospital readmissions from skilled nursing facilities (SNFs) and the accompanying pinch of Medicare readmissions penalties, three Michigan healthcare organizations set competition aside to collaborate and reduce rehospitalizations from SNFs. To solidify their coordinated approach, Henry Ford Health System (HFHS), the Detroit Medical Center and St. John's Providence Health System formed the Tri-County SNF Collaborative with support from the Michigan Quality Improvement Organization (MPRO). 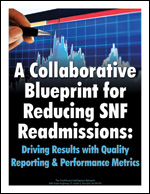 In this 25-page resource, Susan Craft, director, care coordination, family caregiver program, Office of Clinical Quality & Safety at Henry Ford Health System, outlines the roots, framework and results of the SNF collaborative, detailing participation requirements for the more than 130 member SNFs that were developed in tandem with the skilled nursing facilities. HIN is the premier advisory service for executives seeking high-quality strategic information on the business of healthcare. For more information, contact the Healthcare Intelligence Network, PO Box 1442, Wall Township, NJ 07719-1442, (888) 446-3530, e-mail info@hin.com, or visit www.hin.com.